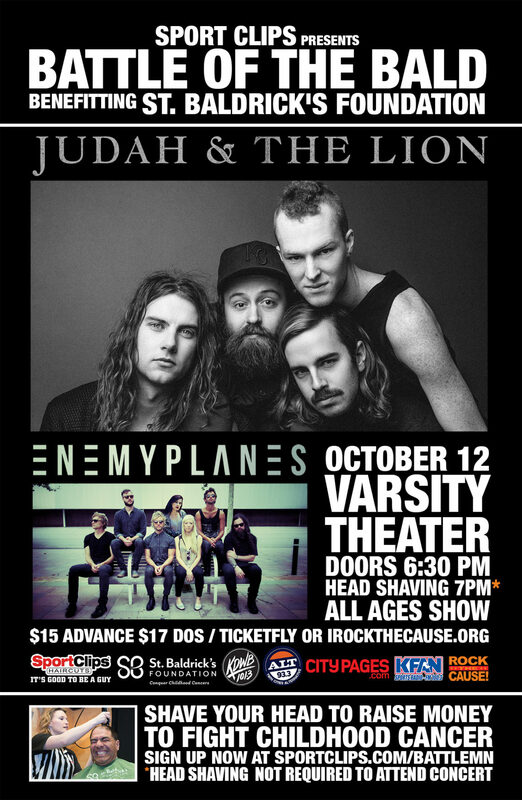 Sport Clips presented Battle of the Bald MN competition kicked off during Childhood Cancer Awareness Month with a feature head-shaving event at the Varsity Theater in Minneapolis, MN showcasing live music by folk hop and roll artists Judah & the Lion w/ special guests: Enemy Planes. Media partners included iHeart Media, City Pages, All Over Media, Comcast Spotlight and Rock the Cause. Nationally Battle of the Bald is the ultimate head-shaving tournament hosted by St. Baldrick’s Foundation. Thousands of college students and everyday people, in an effort to see who can raise the most money for lifesaving childhood cancer research. St. Baldrick’s Foundation is a volunteer-powered charity that funds more in childhood cancer research grants than any organization except the U.S. government. By getting involved participants help give hope to infants, children, teens and young adults fighting childhood cancers!